The Easter holiday is quickly approaching and many people are already thinking about their Easter dinner menu. Every year I make the traditional Easter ham and side dishes but this year I am looking for something different and unique for holiday dessert. Let's face it...if you want to WOW your dinner guests, you need something that is delicious for dessert! Today's recipe is courtesy of Bauli. Please see the company site for product information and additional recipes. This will make 6 servings. 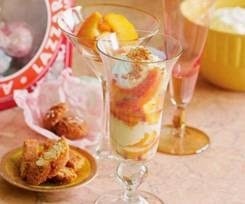 The zabaglione: In a large mixing bowl, combine the egg yolks and sugar and whisk until fluffy and pale yellow. Add the Prosecco and whisk until well blended. Transfer the mixture to the top of a double boiler, place over simmering water and whisk constantly until the mixture is quite thick and heavily coats a spoon. Don't let the mixture come to a boil or the eggs will curdle. Immediately transfer to a large mixing bowl and whisk in the vanilla. Refrigerate the zabaglione until completely cool. Fold in the whipped cream and chill until serving.